Children in poverty often come from less-educated and involved parents, lack supervision, don't have equal learning experiences to their more affluent counterparts, and are more likely to drop out of high school or land in prison. Over the last few weeks, some readers validly pointed out these are generalizations and there are exceptions to the rule. Many more readers also validly pointed out that parents play a critical role in helping students avoid these common pitfalls by keeping kids safe, educated, and productively occupied. Many low-income kids live in one-parent homes with a parent who is gone most of the day working one or more jobs to meet the family's basic needs while juggling personal struggles like debt, addictions, and other challenges. When parents are consumed by worrying they won't meet their basic needs, like putting food on the table or a roof over their family's head, it's hard for them to fulfill higher-level needs, like having time for themselves or having time to talk with their kids. When kids are worried about their basic needs, like if they are going eat or if they will be safe at night or if they will have a place to sleep, understandably, it's hard for them to focus on higher-level needs, like learning multiplication tables during the school day. 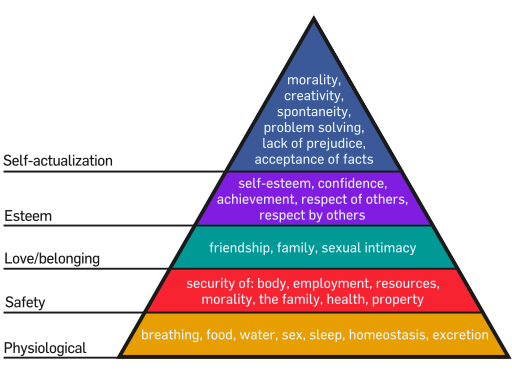 Maslow's hierarchy of needs is a theory that aims to describe human behavior and motivation, and why it is difficult for those who don't get their basic needs met to reach their dreams - or dream at all. The theory is, when someone is struggling to fight off the distraction of getting their basic needs met, it's hard to be motivated to do anything else, even if it's the solution to their problem. Though it has its critics, the hierarchy is a good reference to discuss the obstacles many parents in poverty face when trying to provide for their families, in addition to themselves. Abraham Maslow, creator of Maslow's hierarchy of needs, had his own beginnings in poverty. He was born to poor Russian-Jewish immigrants in an anti-Semitic era; his early years are described as being lonely and unhappy. His parents, though uneducated, required Maslow and his siblings to achieve academic and professional success. Maslow turned to books to fulfill his parents' wishes and escape his loneliness. Like Maslow, much of the idealistic youth of the time who came from a similar background were inspired to overcome "religious and ethnic prejudices to create a world based on economic justice and universal education," according to the Journal of Humanistic Psychology. Whether you agree or disagree that Maslow's hierarchy accurately demonstrates the levels of human motivation, his own personal triumphs are undeniable. There are many successful people who were born into poverty who were freed by a supportive family and an education. The correlation between supportive parents and successful children is clear. It is no coincidence that in the pyramid of human needs and motivation, family is an element that helps cement a solid foundation to personal fulfillment. Dr. Ben Carson was raised by a single, illiterate African American mother. When she learned of her son's declining grades, she required him to read two books a week, though she could not even read the words off a cereal box. With the expectation his mother instilled in him, Carson went from being a failing student to a pioneering neurosurgeon, best known for separating conjoined cranial twins at Johns Hopkins for the first time in medical history. Oprah Winfrey was born to an unwed teenage mother and sent to live with her grandmother who taught her to read at age 3. She later moved to be with her mother, where she was molested by male relatives multiple times between 9 and 13 years old. At 14, Winfrey ran away from home, became pregnant, and lost her child. Her father, who was a barber by trade, took her in and provided her a stable home, where he required her to respect her curfew and read a book and write a report every week. Due to her father's encouragement, by the end of high school, Winfrey was an honor student and on her way to attending Tennessee State University on a full-ride scholarship. Of course, Winfrey went on to be a household name and one of the most successful and influential women in the world. Compared with middle-income children, low socioeconomic status children are exposed to higher levels of familial violence, disruption, and separation. Compared with their well-off peers, 2-to-4 year olds from low-income families interact with aggressive peers 40 percent more often in their neighborhoods and 25 percent more often in child care settings. Numerous studies document that caregivers' disciplinary strategies grow harsher as income decreases. What would be possible if more moms had the expectation Ms. Carson had for her son or the high hopes that the Maslow's had for their son? What if all dads adopted some of Vernon Winfrey's "strict disciplinarian" streak and required nothing less than the best from their children? What if more dads were not in prison, but played a positive role in society, whether they were married or not? Certainly parental expectations and influence play a powerful role at any level of society. Whether you recognize Maslow's framework or not, parents in low-income areas need to be safe, secure in a home or adequate shelter, financially stable, and possess basic emotional and physical health. Once we are real about these needs, then school districts, communities and housing projects can address these areas instead of providing parenting session on largely middle-class topics. Next week, you'll meet a woman who grew up in the most basic of home environments, but who developed an early passion for success, was the first in her family to go to college, and created an impressive career and personal life. I'll dissect what went well and why so that these lessons can be applied more broadly to be helpful to others. If you'd like to share your story or a model story of someone who beat the odds, readers would love to read your confirmation.